Dwarf planets are a new classification of objects that are not quite planets but not quite asteroids or moons. Unlike their big brother planets, dwarf planets do not have the gravitational power to scatter objects that are near their orbit so they end up orbiting the sun in zones where there are numerous other similar objects such as asteroids. The first three objects to be classified as dwarf planets were Pluto, Eris and the Ceres, with Makemake and Haumea following which makes 5 dwarf planets in total although it is thought that there are many more in existence that we have yet to discover. – The object must have enough mass for it to be spherical in shape. – It cannot be a moon. – The object has not cleared the neighbourhood around its orbital path. The main distinction between a planet and a dwarf planet is that planets have the power to scatter object that are near to their orbital path, whereas dwarf planets will not have the muscle to do so and will usually be in a zone with similar objects nearby. The International Astronomical Union added an extra classification to dwarf planets by stating that any dwarf planets that orbit the Sun and are found beyond Neptune should be called plutoids. 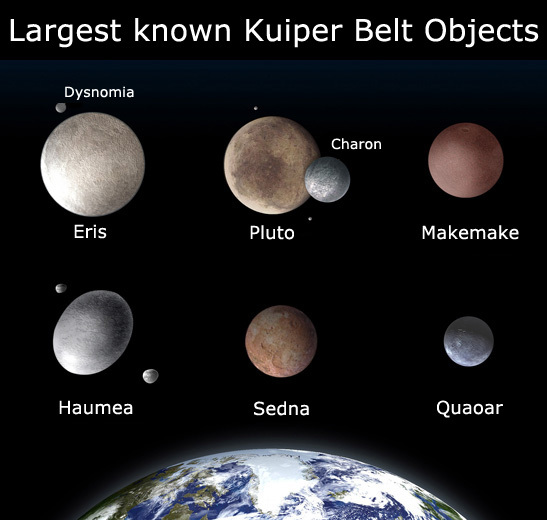 Dwarf planets that can be called plutoids are Eris, Haumea, Makemake and of course Pluto. Read more about each of the 5 dwarf planets.